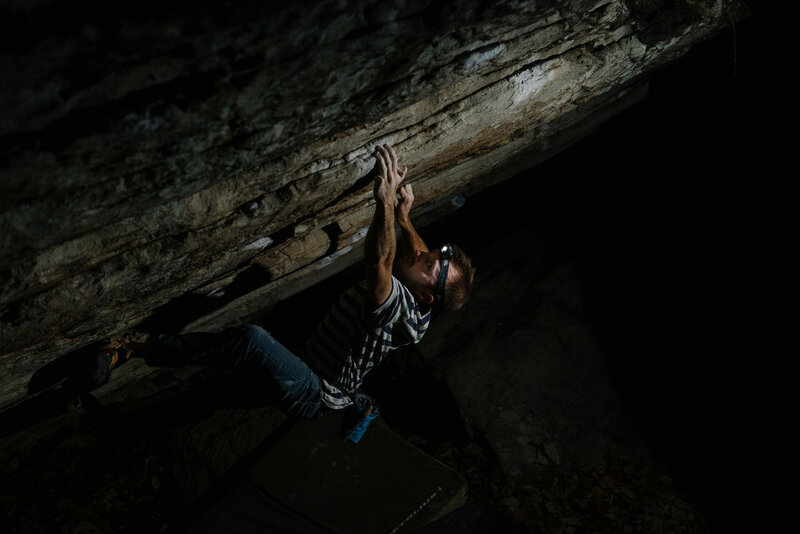 My first bouldering project was sent around 11pm on a Friday night after a full day of work and a two and a half hour drive to Horse Pens 40. I had been thinking about it for weeks leading up to that trip. It was the one that got away on my last few trips down to HP40. I had the bottom wired but the top was tall, and scary, and subtle, and slopey, and did I mention scary? Several of my friends and I had decided to go down for the weekend knowing it was finally going to be cooler weather. We all gathered after work, threw our camping gear together and headed down. After registering and having to sit through one of Mike’s talks about not cutting any trees down we went got our campsite set up and probably made a Mountain House meal since that was the extent of my camp-cooking at the time. After our stomachs were full we would usually get a fire going and settle in for the night but this time was different, it was the beginning of Fall and the air was crisp and we couldn’t resist the temptation. So we wandered into the boulders to see if the slopers were as tactile as we had hoped. After a few warm ups we realized how great everything felt and I just had to give the project a try. We went back and spread our pads out everywhere since we couldn’t really tell where we were going to land. Luckily my buddy Adam was with us and at 6ft 2in and an avid crossfitter at the time I knew I had a great spotter (he has literally caught me in the air before when I fell off of a boulder). Armed with just a couple of headlamps I pulled onto the slots that start Mullentino, I cruised the bottom roof section and found myself at the jugs after the roof, I locked off and reached up with my left hand to start the top out but couldn’t reach quite far enough. I came back down to the jug and shook out a couple of times. The first sloper didn’t feel as great as I had hoped but I knew tomorrow would be warmer and it might be a month before I could get back down here. I locked off again and trusted what I could reach, it was holding, and before I knew it I was standing on top. Ever since that night at Horse Pens there has been something very special about those first few nights outside at the start of the season. Sometimes the humidity is way higher than you would like, sometimes you forget to charge the lights up, but it’s always a lot of fun and the psyche is always high.